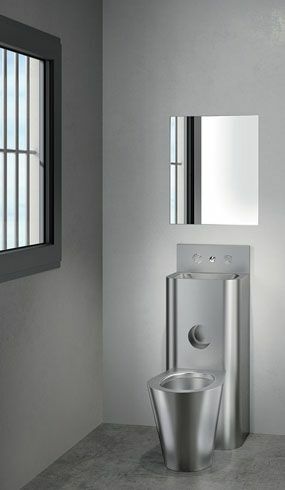 HL Washrooms are suppliers of Delabie's specialist stainless steel prison combination units with integrated toilet and hand wash basin. Specifically designed for custodial environments such as correctional facilities, police cells and any area that requires a high level of vandal resistance such as remote public conveniences, immigration facilities or truck-stops - prison combination units are an ideal solution. The prison toilets can be supplied as a left-hand facing toilet, centre or right-hand facing toilet and can be either floor-mounted or wall-hung (the actual body of the combination unit remains floor mounted, this refers to the WC only being raised above floor level). The standard stainless steel combination units have the flush and basin tap mechanisms housed inside the unit, while the cross-wall units have the services housed in ducting or wall-void if available. Customisations: HL Washrooms can arrange custom combination units to work with installations where a standard off-the-shelf unit would not work. Please contact us with your requirements.